We always go there when we go to Memphis a couple times a year. Looks like a very relaxed environment. Just so long as the customers don’t eat too much fried chicken, since it has a reputation-and other fried foods-for having a lot of cholesterol. (I like fried chicken myself & eat it once in a while). Out of curiosity, do they also serve broiled/baked/roasted chicken)? It’s interesting to watch the customers’ faces. (Not that it’s that easy to study the lady studying the menu as much). I wonder what they’re thinking about? They all each seem like they’re deep in their own thoughts. Fascinating pic. The checked table cloths remind me kind of an Italian restaurant, except they’re usually red/white, instead of black/white. As a life-long Memphian, I can truthfully say that this is one of the most relaxing places to go and enjoy a meal. There is no fanciness at – just relaxed, down home eating. The original one in Mason, TN is the same. Very small, quaint, but everyone knows each other as Mason is very small, but peaceful at the same time. Great post! Charlene, I was wondering where this was located – thanks for the info! L’ha ribloggato su REPUTAZIONE SOLIDALE. Hat dies auf My Shadow Book rebloggt. can’t stop looking at this picture……………..
How was the fried chicken?! No one appears to be eating yet. Reblogged this on I R W A N M E D I A. In 1942, artist Edward Hopper did a painting of a late night patrons in restaurant and it was called “NIGHTHAWKS.” This photo could be a more contemporary yet admittedly low brow version of that panting. I don’t know about anyone else but when I go out to dinner, what ALWAYS makes me feel hungrier is a clear view of a garbage can in the middle of the restaurant kitchen. ‘Yum! Bring me some Onion Rings to go with that Chicken and a Large glass of Buttermilk.’. This is such a great photo of Gus’ Fried Chicken. I went to this place while visiting Memphis last year and would go back if I visited again. Love this place. I looked thru many of your pictures and this is the one that made me think of home, even though I’m not from TN. Might I ask what kind of camera you used? Did you alter it with an antique filter? I hope that at this restaurant, there’s the option of ordering chicken without loads of spices, & that the customer can decide what degree of spiciness/pungency is on their chicken. Does anyone here know if this is Cajun-style cooking which I know from experience is exceedingly spicy, because it would be a shame if someone who wanted fried chicken & goes there, doesn’t have any choice in the matter but to order only one “style” of food. There’s a tv on to the right, I notice. 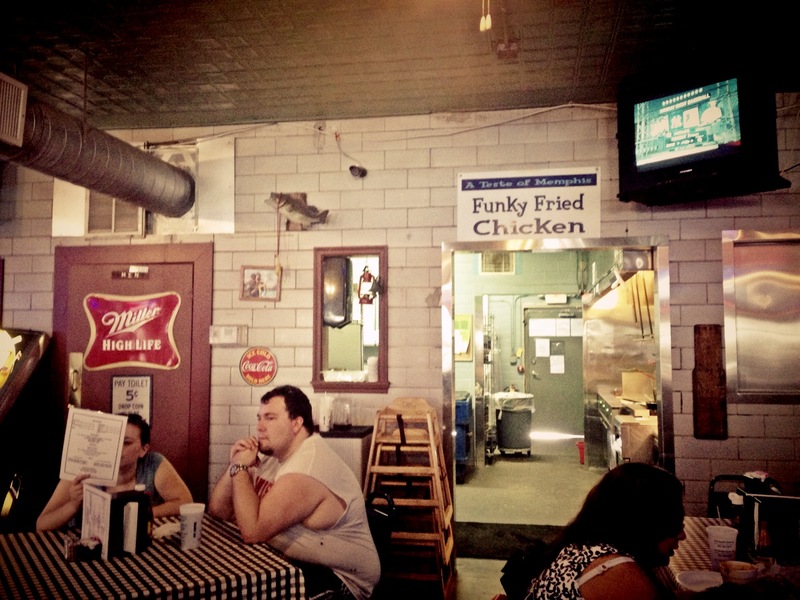 I saw this place on Man VS Food, gave me the biggest craving for fried chicken.